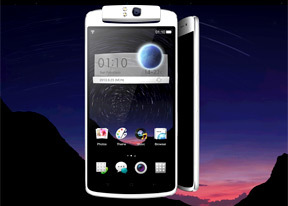 Easily one of the key selling features of the device, the 5.9" screen of the Oppo N1 has a resolution of 1920 x 1080 pixels, resulting in around 373ppi. Oppo puts the screen brightness at 450 nits, not all that much for an IPS LCD like the N1's but in reality the screen looks pretty bright. Hardly a surprise for an IPS unit, the side viewing angles are excellent - it's a high-quality screen, no doubt about that. The screen's digitizer is super-sensitive and the phone can be used with gloves (if you turn that on in the settings menu). 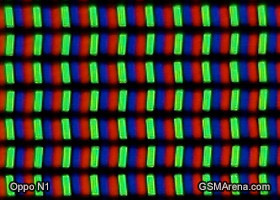 The pixel arrangement is standard RGB with an equal amount of green, red and blue pixels in a line. Below you can see it magnified using our trusty microscope. The contrast of the screen is pretty good and about in line with the excellent Find 5 display. Color reproduction is also pretty great adding up to great image quality screen. The only sub-par element of the otherwise great display is its sunlight legibility. The less than stellar brightness combined with the very high reflectivity add up to pretty poor contrast when exposed to direct sunlight. The Oppo N1 did fabulously in our dedicated battery life test but that was to be expected from a battery this big. The N1 makes use of a 3610 mAh battery. True, it’s not removable, but you won’t need to keep a spare with that sort of endurance. For starters, it took us the amazing 25h of talk time on a 3G network to bring this battery down. Next up was our dedicated web browsing test where it endured for more than 9h. And finally, our dedicated video test ran for a total of 11h 15min before the battery ran flat. We took into account the standby battery consumption with the screen off and we came up with our proprietary battery rating of 79h. That means that the Oppo N1 battery should be good for more than 3 full days given that you use it for an hour of calls, an hour of web browsing and an hour of video watching every day. 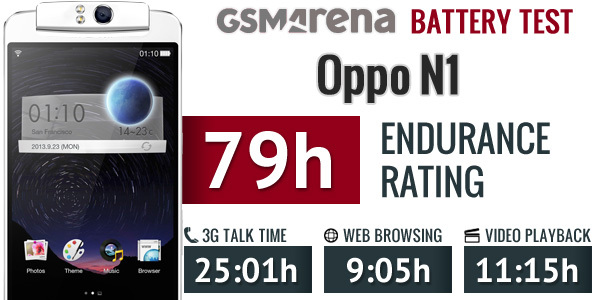 We rarely see scores north of 60h around here, so 79h is almost as good as it gets for a smartphone these days. The N1 also slides between its two main rivals - the HTC One Max (81h) and Samsung Galaxy Note 3 (75h).